What do we love about this grilled chicken and vegetables dish? 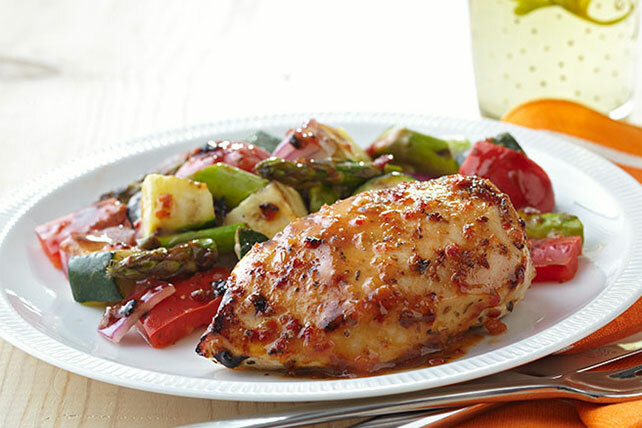 This Summer Grilled Chicken and Vegetables is super-quick, low-cal and delicious! Brush chicken with 2 Tbsp. dressing. Let stand 10 min. Meanwhile, poke holes in bottom of disposable aluminum foil pan. Toss vegetables with remaining dressing. Place in prepared pan. Place chicken and pan of vegetables on grill grate. Grill 20 min. or until chicken is done (165ºF) and vegetables are crisp-tender, turning chicken after 10 min. and stirring vegetables occasionally. Omit foil pan. Place vegetable mixture in grill basket. Grill as directed, shaking basket frequently. Refrigerate any leftovers. Toss with hot cooked pasta and serve as part of a quick supper the next day. Refrigerate any leftovers. Spoon onto crusty bread slices when ready to serve. Sprinkle 2 Tbsp. KRAFT Shredded Cheese over each topped bread slice. Broil until cheese is melted. The aluminum foil pan with holes creates a disposable grill basket, making cleanup even easier.